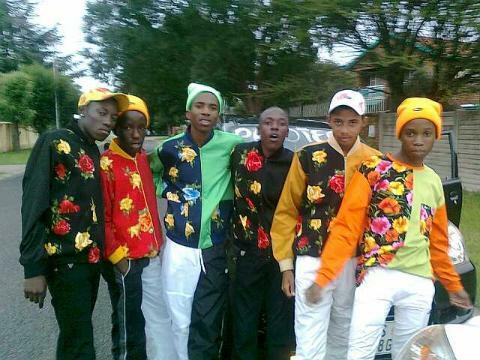 Sometime in late 2006/early 2007, a group of impeccably dressed young men was rumoured to be causing havoc at bus stops in JoBurgs East Rand area. What was curious was that they were hitting each other with expensive shoes for no apparent reason. In the years that followed, similarly outrageous groups emerged all over Johannesburgs slums and small towns. Known as Ukukhotana, this new South African youth subculture quickly gained notoriety for its activities. 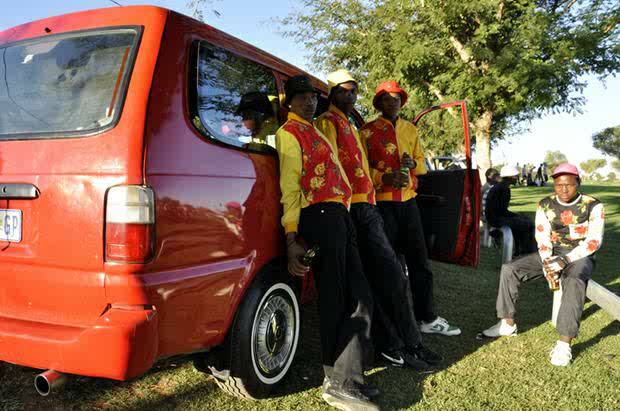 Its members organize into small gangs known as Izikhothane. These groups regularly meet at public spaces such as parks to compete about who wear it best. It is not just about colors or designer labels but the swag with which one owns the look. The sartorial know-how is weaved into dance battles that take place during these pre-arranged meetings. As if the idea of ridiculously-dressed young men was not enough, they also burn money and clothes to show how rich they are. Think of Ukukhotana as a bragging battle, a spectacle-involving performance where members of different Izikhothane like to show that money is no object. They tear up currency notes and set them ablaze in heaps with designer jeans and suits. They also pour bottles of expensive liquor and throw away expensive food, mostly buckets of chicken from the KFC chain. The term Ukukhotana comes from two individual Zulu words that mean to lick like a snake (izikhotha) and to mock (Ukukhothana). The phrase most likely refers to the action of licking fingers to count money. The subculture has roots in a previous group called the Swenkas. The Swenkas appeared in the 1950s among Zulu migrant workers. They dressed impeccably and took part in amateur competitions that were part fashion show part choreography. The prizes were mostly money and household goods they would then send to their families. The current culture is different in several key aspects. The most significant is that unlike the Swenkas who held jobs and funded their own expensive hobby, the Ukukhotana is made up of spoilt kids. Enthusiasts are mostly teenagers enthralled by a subculture of materialism and consumerism, and who have no sense of financial responsibility. Their involvement is defined by a yearning for fame and recognition. 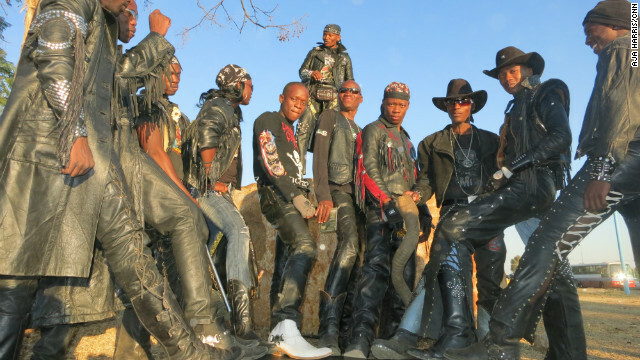 Call them the Metalhead Cowboys of the Kalahari or the Renegades of Gaborone when you see them roaming Botswana in their old-school metal getup of leather, studs and cowboy hats. As they troop into heavy metal concerts, you can spot them by their polished black leather, chains, and skulled belt buckles. In this small South African nation lies a pocket of Skull and Bones enthusiasts who don leather from head to toe, however sunny it is. They combine their African heritage with the heavy metal dress code meshed with Cowboy and Biker subculture elements. The subculture started in the 1970s when the band, Nosey Road, was formed in Botswana. Nosey Road first played classic rock and then branched off to other forms of the genre. In the years that followed, heavy metal proved the most resilient sub-genre and attracted young enthusiasts who turned it into a subculture. They became famous after South African photographer Frank Marshall featured them as the centrepiece to a show called Visions of Renegades. Today, there are powerful riffs between the different heavy metal bands such as Skinflint and Wrust. Rock enthusiasts attend concerts religiously and always don the meanest of metal looks complete with a cowboy hat and boots. It is important to look the part as dressing is a central part of the subculture. There are even competitions among Botswanas metallers to see who can look most brutal. There is a long-running rumor in the subculture that Botswana president, Ian Khama, is a not-so-secret metalhead. 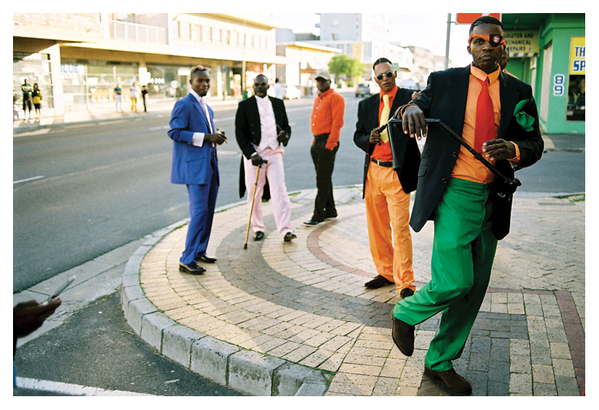 They easily stand out on the streets of Brazzaville and Kinshasa in their tweed, double-breasted tailored suits. They walk with a curios gait as they fiddle with their majestic walking sticks and smoke pipes. When they sit, their immaculate footwear demands recognition. Unlike the Ukukhotana of Johannesburg, the La Sape of the two Congos considers its dandyism a code of living. Although most of them live in slums and poverty, they make an extra effort to always look good. Expensively so. Being a sapeur is a calling that requires one pay homage to certain rules of dress and lifestyle. It is not enough that one meticulously match colors when selecting whether to wear a suit by Yves Saint Laurent, Jean Paul Gaultier, Armani, Yamamoto or Kenzo. One must consider how this rolls in with the pair of shoes for the day, the pair of socks, and other details. The labels have to be authentic and distinguishable. Hygiene and manners must be of the highest order, and drugs are a complete no-no. This modern dandyism has its roots in the colonial cultural segregation. From at least the 19th century, European colonists dressed their butlers and servants impeccably to have them blend into their luxurious environments. In the Congo, houseboys were paid in clothing instead of money. Then in the Roaring Twenties, Bapopo or Coastmen migrant workers in the Congo brought with them their dandyism as a form of cultural protest against French rule. La Sape is an abbreviation of Socit des Ambianceurs et des Personnes lgantes (The Society of Ambiance-Makers and Elegant People). Members, who are mostly men, are known as Sapeurs. They are defined by their silk handkerchiefs, pink corduroys and overall sartorial know-how. In the middle of a war-torn economy, they have managed to distinguish themselves as a pacifist grouping of modern dandies. It is in truth part fashion, part protest and part outrage. The movement is centred in Brazzaville, the capital of the Republic of Congo. In Kinshasa, the capital of the neighboring Democratic Republic of Congo, the movement suffered under Mobutu Sese Sekos rule. The strongman banned all forms of Western clothing, in turn making sapeurs the symbols of cultural protest. In the 1970s, rumba king Papa Wemba became the icon of this protest. 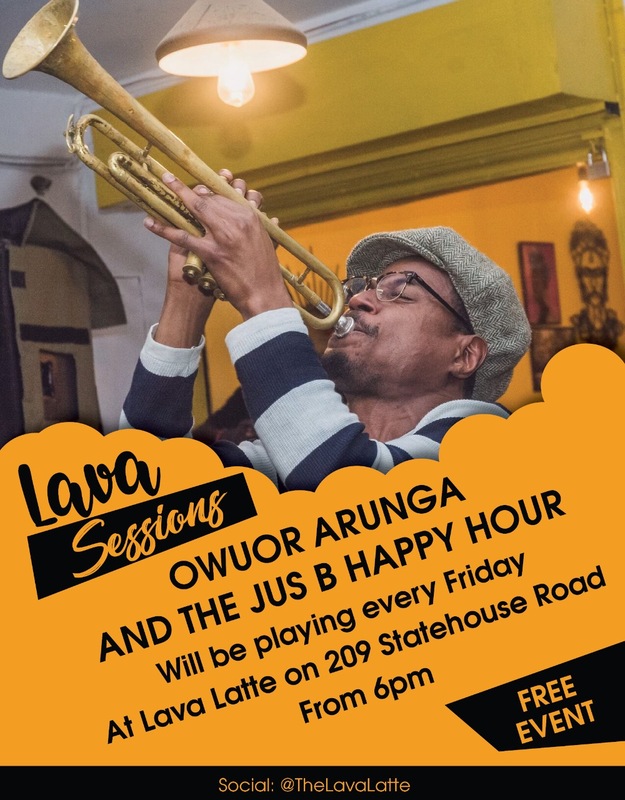 As a performing artist with numerous gigs in France and other European countries, Papa Wemba was the perfect virus for the fashion and attributes of the La Sape. For his endeavours, he is now known as La Pape de la Sape (pope of Sape). He even established his own village with a set of moral codes that emphasize smart dress and hygiene. Other icons include Andrea Matsoua who is known in the movement as The First Grand Sapeur. There are sub-groups such as the Piccadilly group who wear Scottish kilts. Younger groups engage in activities that match those of their South African peers, essentially competitions to see who wears it best. It is a scene from Victorian-era Europe. Women dress up in long heavy dresses whose fullness is assured by the numerous layers of petticoats underneath. Boys dress in Herero cavalry dress while men adorn different fashions that pay homage to 19th Century Europe. It is an ironical form of cultural protest, a cultural symbol of a people who survived the worst of horrors. In 1904, the Herero people of what is today Namibia rebelled against their German colonizers. What followed was a period of systematic genocide and outright annihilation. By the time the rebellion died out in 1907, only 15, 000 of what had been a community of 80, 000 people survived. The meagre 25 percent of the population that remained skirted the next decades of colonisation carefully, doing their best to continue the Herero bloodlines. With the blooming people came an interesting addition, Victorian-era fashion. The fashion was introduced by the wives of German colonists and missionaries in the early 20th Century. As the Herero-German War continued, the only way to survive seemed to be to adapt and be assimilated, at least to some level. Today, the Herero are safe from annihilation and only retain the fashion of their former oppressors as a reminder of the scars of their past. The hand-sewn dresses now represent a woman’s position in society. 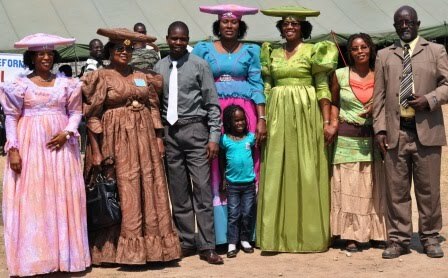 They are considered the only proper dress for married Herero women. With time, the community accessorized the look by adding elaborate headgear built to represent the horns of cattle.